In the twentieth century, 40 to 60 million defenseless people were massacred in episodes of genocide. The 21st century is not faring much better, with mass murder ongoing e.g. in Myanmar and Syria. Many of these cases have been studied well, both in detailed case studies and in comparative perspectives, but studying mass murder is no picnic. Scholars have also examined how conducting research, including ethnographic fieldwork, archival investigation, and oral history interviews, can affect the researcher in profound ways. Among a broader set of difficulties that obstruct research on this wretched subject, two stand out in particular: political constraints and psychological attrition. Having to contend with the taboos, restrictions, prescriptions, and outright threats of authoritarian regimes keeps scholars working on these topics under permanent threat. Researchers bold enough to travel into these societies to visit sites, uncover evidence, interview witnesses, and have got to fear the security services and intelligence agencies of these states. One consequence of this discouraging atmosphere is that, in general, less research is carried out on those instances and episodes of mass murder, an undesirable blind spot due to the importance of the events. (Some researchers ingratiate themselves with the authorities for privileged access.) A second consequence poses a methodological dilemma: due to such constraints, does one launch a sting operation, like undercover journalism? Or does one use informants, fixers, and mediators on the ground? Does one pay the possible interviewees for taking the risks? We may not be willing or able to change our research topics, but we do need our colleagues and audience to be aware of these challenges. There are significant emotional consequences of studying mass murder. All social research also operates in a dense emotional and moral field. As a general problem in the academy, involvement and detachment has been dealt with at some length, but the study of mass violence is particularly relevant from this perspective. Though a certain amount of passion and involvement can facilitate one’s commitment to the topic, it requires a great deal of detachment to sift through documents and memoirs containing very intimate details of killing. Detachment is even more challenging in ethnographic fieldwork and oral history interviews, as empathy can transmit to scholars the interviewees’ powerful negative emotions. Since the beginning of the Syrian crisis, I began interviewing Syrians about their experiences with violence, as part of a large-scale oral history project we are launching in the Netherlands. Having interviewed about 80 survivors and eye witnesses so far, their emotions of anger, sadness, fear, survivor guilt, and anxiety has affected me irreversibly. These types of interviews can be an alienating and isolating experience: the more one is absorbed into the stories of the eye witnesses, the more one is also drawn into their emotions. As a general rule of thumb, I felt compassion when interviewing victims, and indignation when interviewing perpetrators. But the interviews left a mark long after I stopped recording. When one young woman from Aleppo told me that she was raped in an ambush and witnessed a beheading up close, I was aghast at that moment. Ever since, I have not mustered my courage to go over those particular interview transcripts and notes. All in all, the risks of political threats and psychological attrition need to be taken seriously by academic institutions, journals, and colleagues. These constraints can produce setbacks and potentially lower productivity, even with appropriate self-care. We may not be willing or able to change our research topics, but we do need our colleagues and audience to be aware of these challenges. Featured image credit: Flowers in a Khmer Rouge jail cell by alex.ch. CC BY 2.0 via Flickr. Uğur Ümit Üngör is Associate Professor at the Department of History at Utrecht University and Research Fellow at the Institute for War, Holocaust, and Genocide Studies in Amsterdam. His main areas of interest are state formation and nation formation, with a particular focus on mass violence. 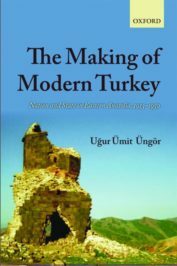 He is the author of The Making of Modern Turkey: Nation and State in Eastern Anatolia, 1913-1950.